This type of corrosion cells may occur in soils when a metal is exposed to an environment containing varying levels of electrolytes either of different substances or of the same substance in different amounts. For example, if one electrolyte is a dilute salt solution and the other a concentrated salt solution, a concentration cell may be formed. This takes place because one of the factors that determine an electrode potential is the electrolyte concentration. The dissolved salts can be quite complex mixtures. They usually include compounds of aluminum, calcium, magnesium, and other metals, and they may be sulfates, chlorides, hydroxides, or any one of quite a variety of other compounds. The role played by these salts can also vary greatly. Chloride ions, for example, can be quite aggressive towards steel and sulfate ions can serve as nutrients to sulfate reducing bacteria (SRB) which themselves can be extremely damaging to most buried metals. In the example shown in the previous section, the main difference in the environment surrounding the steel anchor is due to the variation of pH between the soil, which can vary greatly depending on the type of soil but often acidic, and the pH in the concrete anchorage for which the pH is always basic and higher than 10. Because this higher pH is protective to steel it naturally follows that the steel in concrete becomes the cathode drawing an anodic current form the adjacent steel in the soil. A concentration cell common during the corrosion of reinforced concrete exposed to salts containing chloride ions, e.g. marine environments or road deicing salts, is illustrated in the following Figure. 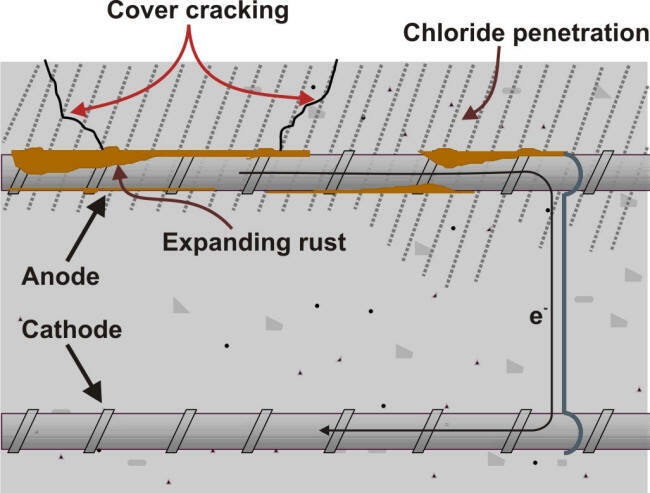 In such cell the reinforcing steel in contact with the mobile chloride ions may become vulnerable to corrosion due to the depassivation of the steel. The process is further accelerated due to the presence of bars embedded deeper in the concrete. These protected bars can then serve as cathodes because of the attaching strings serving as electrical connection. 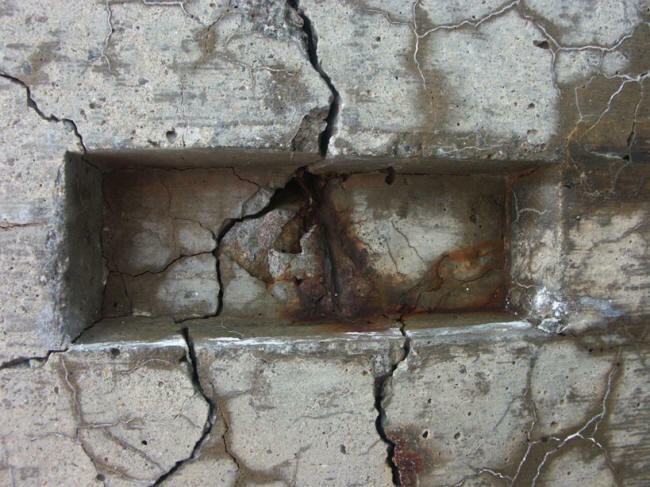 The resulting stresses produced by an accumulation of corrosion products may cause cracks to initiate and grow causing the degradation of reinforced concrete below. An equivalent volume expansion ratio of 3.0 to 3.2 has been measured due to the formation of corrosion products on steel bars embedded in concrete . Cracking of concrete cover in marine environment.